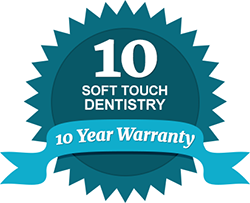 If you are looking for a painless, permanent cosmetic solution for your stained, chipped, discolored or misaligned teeth in O'Fallon and the surrounding communities of St. Louis, Soft Touch Dentistry can help. Dr. Sarah Thompson is an experienced and highly skilled cosmetic dentist who specializes in lumineers and other smile-changing services. At our family dental practice, we want patients to gain the brilliant, confident smile they were meant to have. We deliver state-of-the-art cosmetic dental services in a caring, stress-free environment. Our practice is proud to offer lumineers as one of the most advanced and minimally invasive smile correcting solutions available. We believe that cosmetic dental work such as lumineers should look, feel and function like your natural teeth. Lumineers are an excellent solution to restore damaged or unsightly teeth without having to remove any existing tooth structure. These ultra-thin, very durable smile shapers are placed over your existing teeth to create a natural, radiant smile. Dr. Thompson realizes that no two smiles are alike. She carries the precision and artistry to meet your individual smile needs. Lumineers are a long lasting and painless alternative to porcelain veneers that keeps your natural teeth in tact. Many patients consider lumineers as “instant orthodontics” to correct a crooked smile, and they can also be placed over existing crown or bridgework without having to replace them. Whether you are looking for that smile you once had or the dream smile you’ve always wanted, contact our dental practice today for your free consultation to learn how we can make it a reality. Our office is currently welcoming new patients and we offer many payment options and flexible financing plans for your convenience. Let us help you achieve your best smile with the latest advances in cosmetic dentistry.